Glaucoma is a condition which is characterised by damage to a certain sub set of nerve cells in the back of eye. This typically tends to happen at the level of the optic nerve. There are many different types of glaucoma, but the end affect is frequently the same for all. The end affect generally relates to loss of these important nerve cells, which can be likened to the disconnection of an electrical circuit. 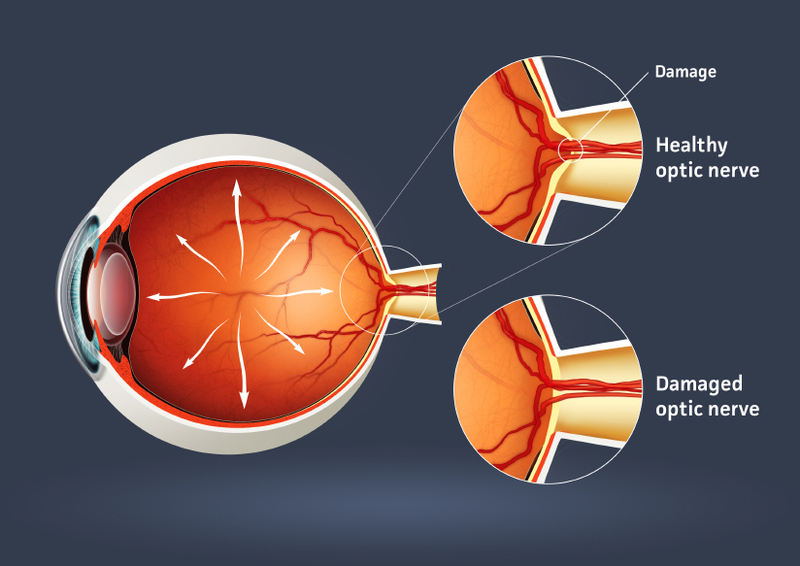 Glaucoma is one of the leading causes of blindness in the western world, and in England it is estimated that almost half a million people have glaucoma. It is frequently the case that glaucoma will not be recognised by the patient. Most commonly it will be picked up by routine screening either when seeing an optometrist, or another eye care professional. 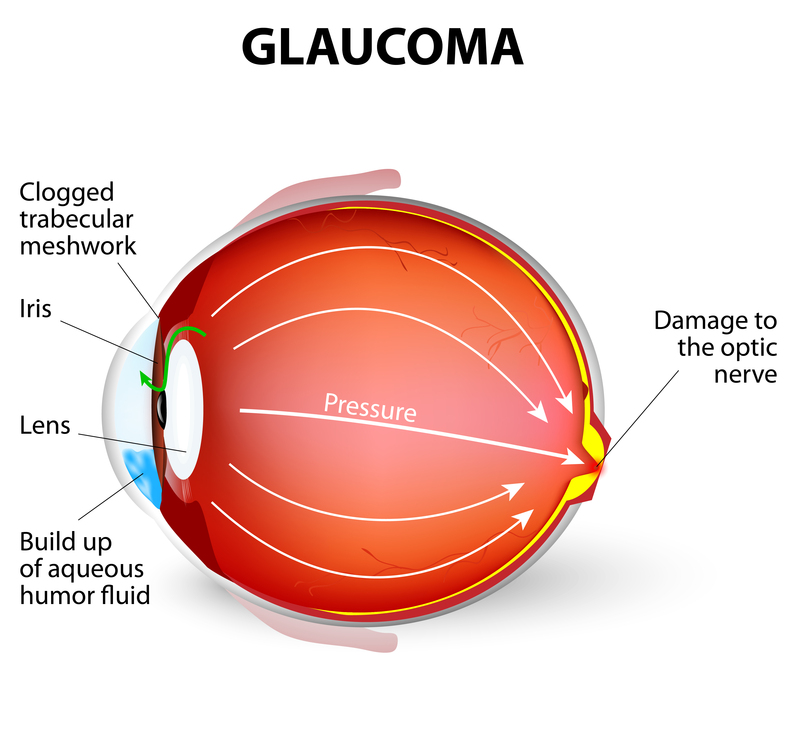 Very occasionally glaucoma can present in an acute fashion, where the pressure can be extremely high secondary to a closed outflow of fluid from the eye. This is typically painful and presents with significantly reduced vision. This is termed “acute angle closure”. Glaucoma is typically diagnosed through the recognition of raised intraocular pressures (IOP) during an eye examination. This may sometimes prompt further investigation such as visual field testing, or alternatively optical coherence tomography (OCT) testing of the optic nerve, which may demonstrate evidence of glaucoma. If glaucoma remains untreated for a long time, then the patient may then start to notice the peripheral vision being less sensitive. If at this point the condition is not treated, then visual field may continue to become restricted which will eventually lead to significant visual loss. Glaucoma rarely leads to total loss of sight, but can cause significant symptoms secondary to loss of peripheral vision. Why do people get glaucoma? There are many reasons why one person should develop glaucoma, and various risk factors are at play in the development of this condition. Glaucoma is most common in the over 40s, and so age remains a significant risk for developing glaucoma. Additional factors include genetic predisposition, race and use of certain medications can also induce glaucoma (such as steroid drops or tablets). 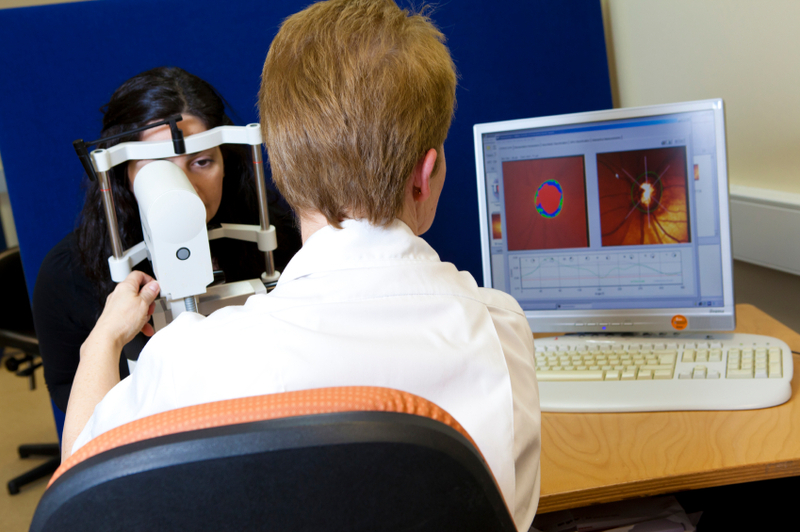 As many people do not even realise that they have glaucoma, one of the most important factors in managing it is regular monitoring. This will often be in the form of measuring intraocular pressures (IOP), alongside measurement of the visual field, and an examination of the eye as a whole. 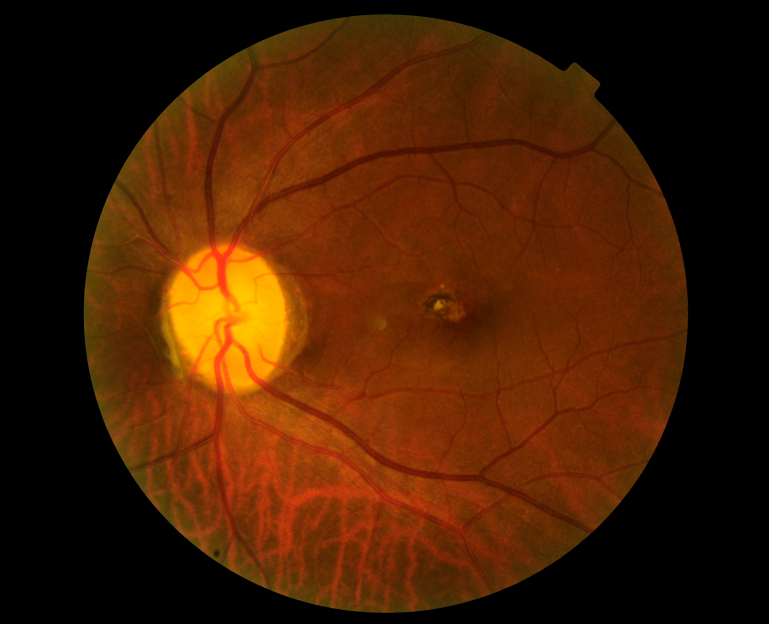 Additionally more objective measurements such as optical coherent tomography (OCT) or Heidelberg Retina Tomography (HRT) of the optic nerve head will be undertaken, to allow us to determine to amount of damage that has occurred at the optic nerve (Figure 3.0 and 4.0) At the first visit, often many measurements will be taken as a baseline, in order to allow more effective management in the future. The treatment of glaucoma can vary immensely, and ultimately this will depend on the stage of glaucoma at presentation. In the first instance, if glaucoma is diagnosed, usually we would recommend starting certain drops to use in the eye, in order to reduce the pressure. By reducing the pressure within the eye, this can prevent cell death, and hence preserve visual field. If it becomes apparent that the prescribed drops are not lowering the pressure to an adequate degree, then there are further drops which can be added. Sometimes it may not be possible to control the intraocular pressures to a satisfactory degree with drops alone, in which case laser can sometimes be used, or even surgery. Typically surgery is reserved for when glaucoma is difficult to manage. What management options may become available in the future? The treatment of glaucoma is constantly changing. This can be in the form of new drops becoming available, as well as new techniques such as laser and various surgical techniques. It is becoming increasingly popular to use techniques to control intraocular pressures at the time of having cataract surgery, such as the use of the i-stent.